Baby E turned three this month so he’s not such a baby now *sigh*. So I guess from now on we’ll call him ‘Little E’. His bedroom is probably my favourite room in the house. It evolved in to what it is now mainly over the course of a year and since then there’s been a big removal, in the form of his beloved cot and a big addition, the Lightning McQueen bed his Daddy bought for his second birthday which was slept in for around two nights. The latter is still in the room pressed up against the radiator and I can’t wait to get rid of it! 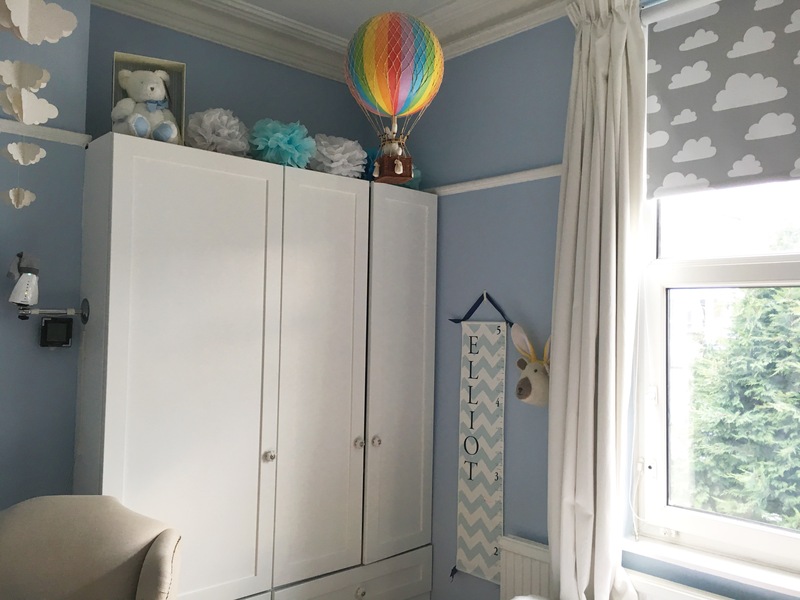 When choosing the paint colour initially I was planning for the room to be a very girly dressing room as I didn’t know I was pregnant. When I found out my happy news I decided to stick with the colour I’d already decided on because it would suit a boy and be a cool alternative for a little girl. It’s ‘Pale Delphinium’ by Laura Ashley and the decorators said it was the best paint they’d used in terms of application (Farrow and Ball takes tons of coats). It’s such a pretty blue and so striking against the white picture rail and ceiling and is reminiscent of Wedgewood. A picture speaks a thousand words, so here we go…. 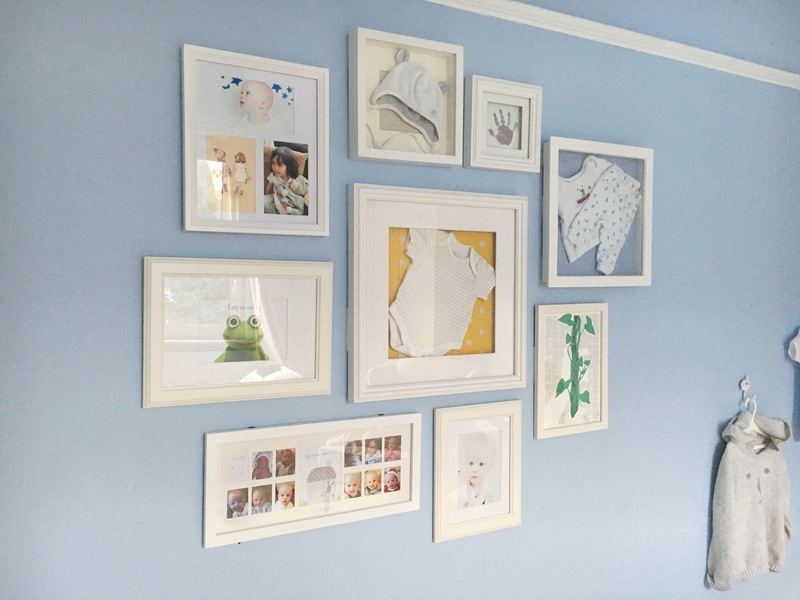 The picture wall I put together while on maternity leave and I pushed myself to finish it in time for his Christening which happened at 6 months…. although I still haven’t finished the ‘my first year’ frame in the bottom left corner. The 3D shadow frames are from Hobby Craft and most of the others Ikea. I looked through photo wall templates online and found it very confusing deciding how to lay them out and eventually placed them on the floor and moved them around until I was happy. Then I took a photo and tried to get them on the wall exactly the same. I knew that I’d be very stressed putting nails in the walls and they’d keep going in the wrong places so decided to use 3m picture hanging strips which are so easy to use and allow some adjustment. 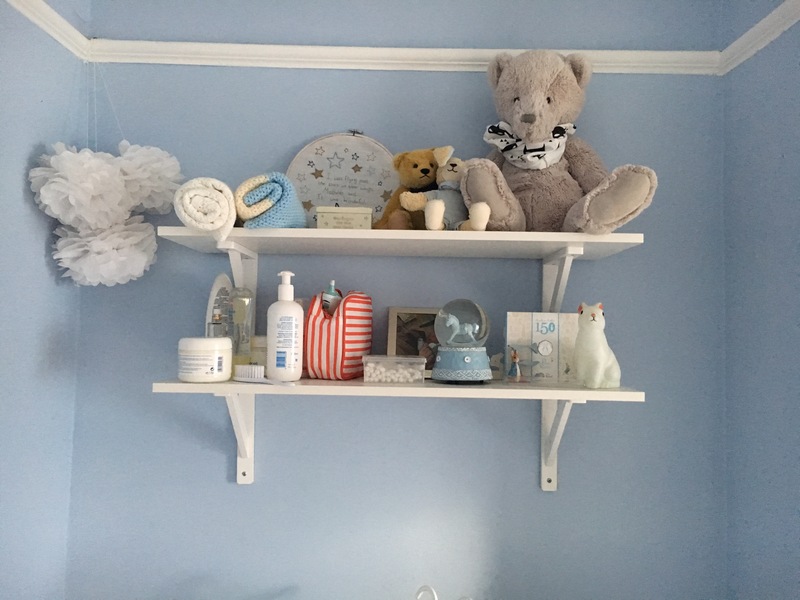 I wanted a particular decorative shelf that I’d seen on Pinterest (similar to the Any Which Way shelf at GLTC) and couldn’t find it anywhere at the time, so we ended up buying these simple brackets and shelves separately from B&Q whilst I was pregnant, but shortly before I went in to labour six weeks early! They were quickly put up whilst we were in Hospital for a few days and even though I wasn’t there the spacing between them was fortunately almost right 😉 The pompoms were made by me out of tissue paper and the embroidery hoop I’ve featured on her previously and was stitched for Little E by a very lovely Aunty. I could have spent time tidying before snapping but this is real life, thermometer and ear buds included! The blankets include a shawl my Mum used for me and my older sister and brothers, and a blanket knitted by my Grandmother. The snow globe with a horse inside is beautiful and was a Christmas gift from my sister, and my mother in law gave us a lovely anniversary Peter Rabbit coin which we’ll treasure. Underneath the shelves we still have the change station and baskets which now store his trousers, pjs and vests. And still some nappies…we need to get a wriggle on with that! We were very fortunate that the room already had the built in wardrobe although it and the entire room were dark blue so it took a few coats to get it white and I swapped the white wooden knobs for some pretty ones. 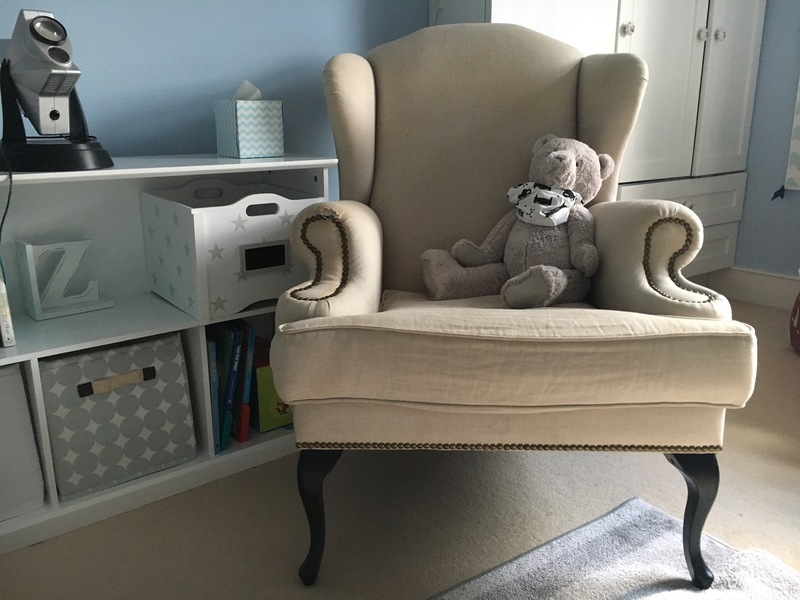 The cloud mobile is from The White Company and the Harrods Bear was a (very lovely!) gift from a great Aunty. The paper pom poms we’d had from the Christening and made themselves at home. One of my favourite items is the hot air balloon which Hubby and I got while celebrating our wedding anniversary in Bath (it was our first trip away from baby – he was just three months!). I was worried the colours would be too bright and Hubs talked me in to it and I’m glad he did. The height chart (spot the scribble!) is by DaisyPrintCo on Etsy and the bear head was ridiculously cheap in the post-Christmas sale at M&S a couple of years ago. 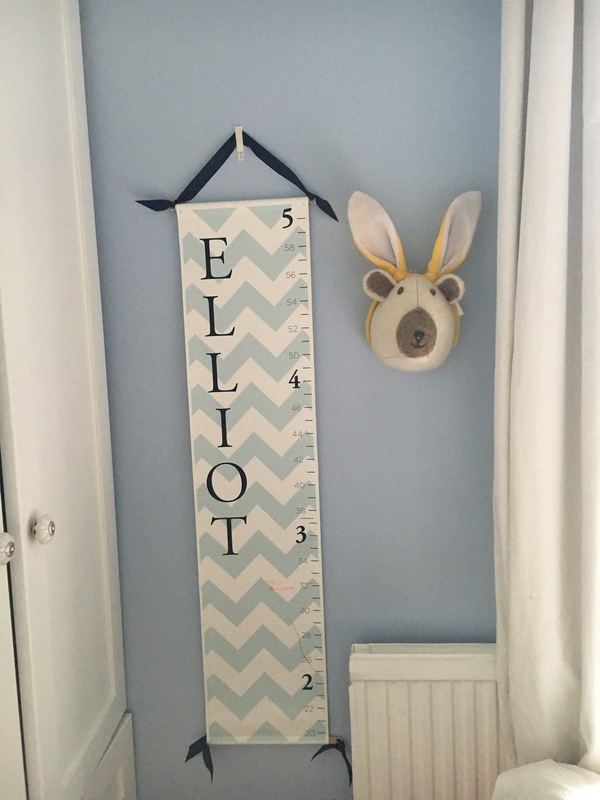 It was so cheap (£1.50 I think) that I bought another as I know it’s the type of thing my sister would love and she can put it in her nursery when the time comes. We have load of bunny ears stuffed in toy boxes from when we had a Bing Bunny themed party for E’s 1st Birthday, and these one’s somehow ended up on Bear (who has sometimes ended up in E’s bed). Partly in shot is the day bed I bought very cheaply from Dunelm with the aim of reading books on it (back when I was planning a dressing room). The colour was described as ‘dark cream’ but arrived looking a bit green so I gave it a quick coat of Annie Sloan Chalk Paint in Off White. Once E started sleeping in the nursery (i.e. waking constantly through out the night) this was our saviour and I highly recommend putting a bed in every nursery where possible. Since we took away the cot and gave E his Lightning McQueen toddler bed a year ago he’s decided to sleep in the day bed so it’s his now…but he does like to share with us still! 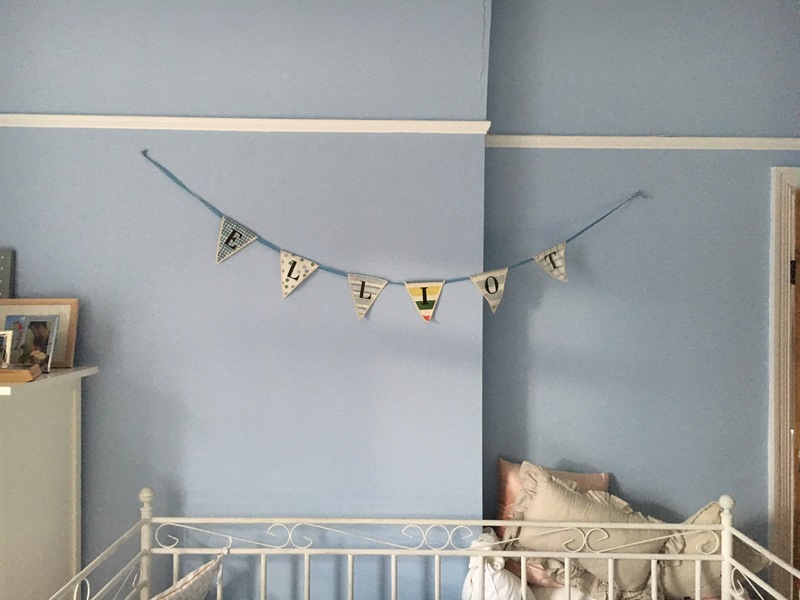 The Bunting I got for his Christening and repurposed to his room just a few months ago. The cushions were purchased to look pretty on the day bed but obviously just live stuffed between the bed and wall now. In the Chair is Big Ted who was gifted to E by his very lovely Uncle A and Aunty R at the hospital when he was a few days old, when baby was much smaller than bear. He spends a lot of time in bed with E, and on the floor, and is a dear friend. He wears a batman snood that I got on ebay for E but is much too small (it came from China). The Chair I found from a second hand chair shop who decided to put it outside one sunny day when I happened to be walking by. The latest purchase is the Abbeville Storage Shelf Unit from GLTC which I had my eyes on for ages and finally ordered in the January Sale. I’m now thinking he definitely needs one of the bigger items in the range…well he always needs more storage! 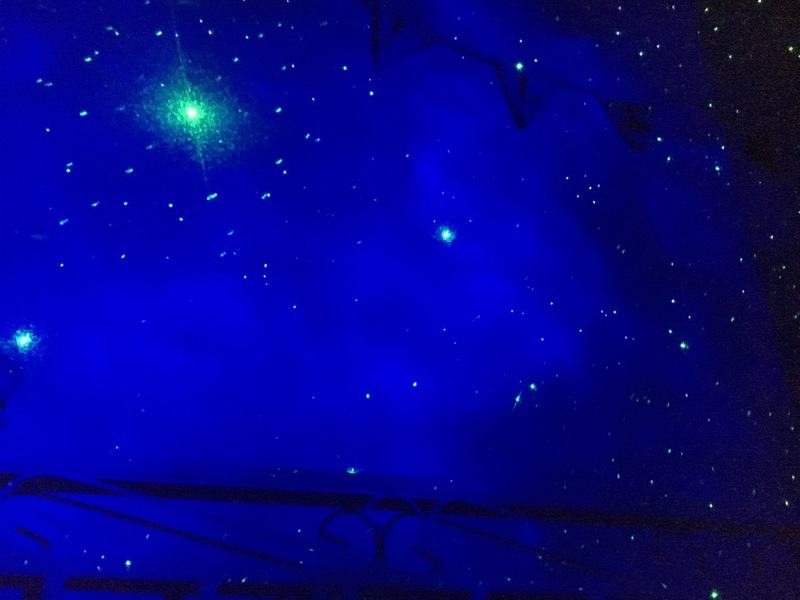 And on top of that is a star machine which is very special and creates very lovely calm moments and is E’s favourite way to fall asleep at the moment.